Of wine and a maker I sing. 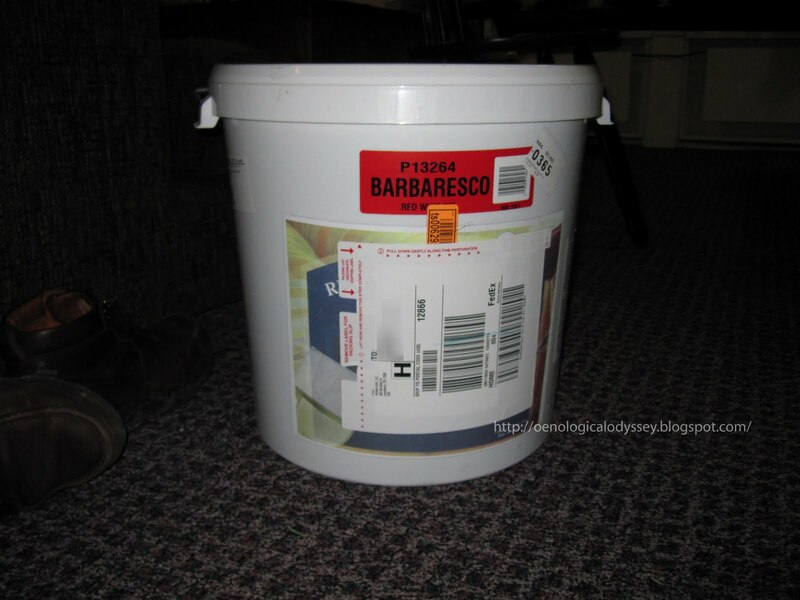 Equipment and a bucket of Barbaresco arrived two weeks ago, brought in by my wife and her student slaves. I knew nothing of wine-making. Yet since my life swung into wine sales in April of 2009, I felt implored to follow the Fates beyond their intent. I plan to make horrible wine. If this experience will teach me anything (i.e. 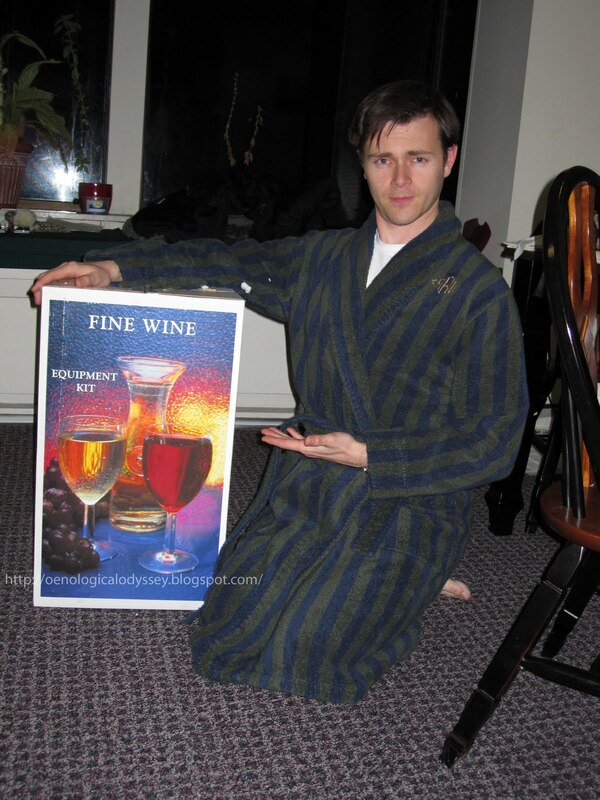 don’t make wine ever ever again) then I succeed. Also rebellion. Alcohol is not only banned in campus housing (where we live) but I bet production is unspeakably frowned upon. Thus, like my vaguely related (appropriated) bootlegging forefathers, I fight the powers that be in the name of hobby. Also Amazon’s shipping is free. First, did my must survive? Cracking the lid wafts up tones of grape and red berries. No rot. The 30 free labels, corks and caps are cute but superfluous. I dig. Nothing lists the grapes, vintage, provenance or chemical breakdown (although unusable nutrition facts include: 79 grams of carbs and sugars (convenient), 22% of Vitamin C, and traces of Sodium, Calcium and Iron). Sure Barbaresco is a region, but words like Nebbiolo or Italia are far from found. Worryingly, the juice is most likely sugared/tinted-up Canadian red perfectly balanced for fermentation in Paklab’s factories. The label claims this is “Reserve du Chateau”,’s “Quality Sterile Must” with “100% Satisfaction”, while the only certain ingredient is “Varietal grape juice”. The rest “may contain” anything from oak to shellfish derivative. Since Barbaresco sees not as much oak as its Barolo bretherin, I pleasantly found only packs of cleansers, fining agents and yeast. My pride set aside, I unveil the equipment that shall turn my 100% satisfaction into 110%. Like a Russian doll, each inner box reveals a surprise. Far from any regular set, this box proclaims itself a “Fine Wine Equipment Kit” expectantly disregarding whatever swill goes in it. So it will make magic of my Italicanadian Barbarescowelches. 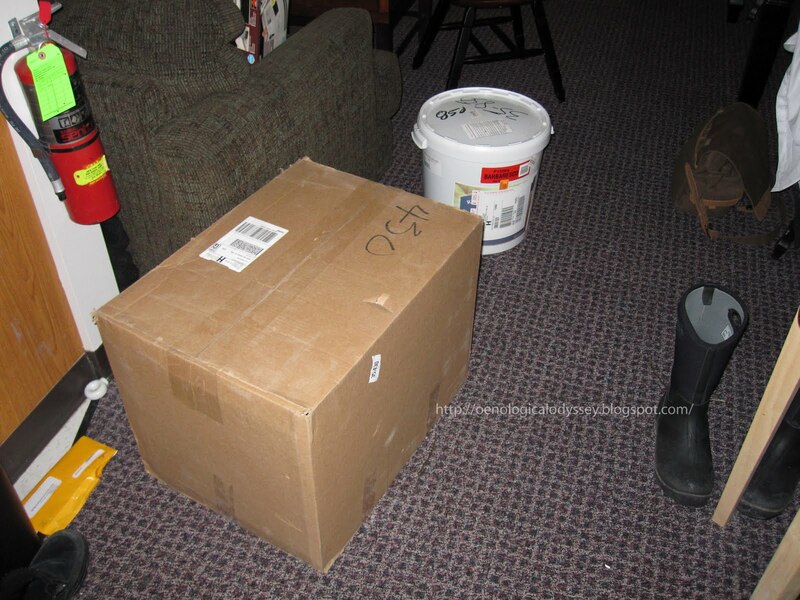 Smaller and smaller boxes reveal plastic tubes, tools, tubs and a gleaming glass carboy. This set also provides an additional 30 corks, you know, to make 60 bottles with. Near oenological climax I decide to stop, clean up and sleep. My wine can wait. DISCLAIMER: Kit wines do not make wine. Just as a kit Maserati Granturismo looks great but will never drive or handle like a proper car. Yet very few can afford the land and labor for grapes, let alone oak barrels or custom bottles. I make wine to test my vague theories learned in selling wine and taking WSET certifications. If I become a martyr for future bootleggers, all the better. 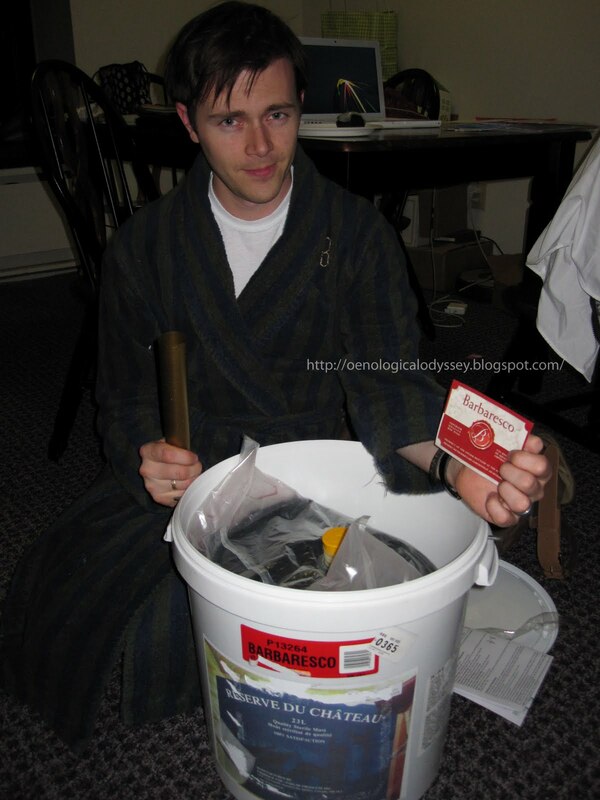 This entry was posted in MYTHMAKING: CRAFTING MY FIRST WINE (February - March 2010) and tagged alcohol, barbaresco, bootlegging, cellar, fermentation, grapes, kits, nebbiolo, oenology, viticulture, wine, winemaking. Bookmark the permalink.